Character Actor Of The Day: Hugh Sanders. | 50 Westerns From The 50s. « DVD Review: City Of Bad Men (1953). Character Actor Of The Day: Hugh Sanders. Character actor Hugh Sanders stayed busy throughout the 50s, in both features and on TV — with parts in pictures like The Wild One (1953), Jailhouse Rock (1957) and To Kill A Mockingbird (1962). From Illinois, Sanders worked in radio before making the move to Hollywood in 1949. 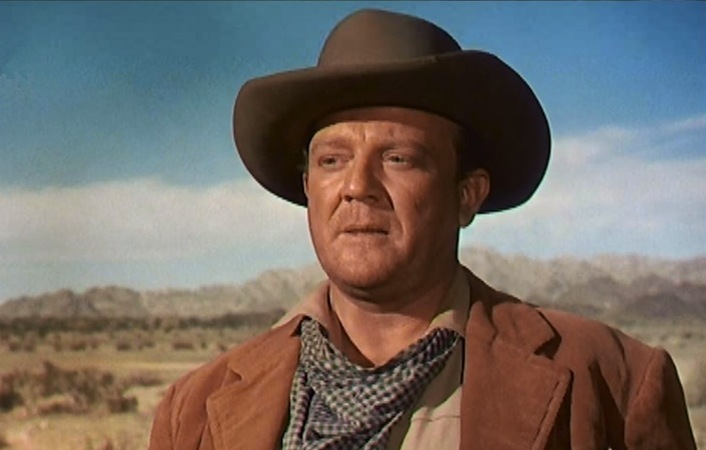 He made a number of Western features before his death in 1966 (at just 54), such as Last Of The Comanches (1953, above), The Guns Of Fort Petticoat (1957) and Warlock (1959, below). He played a lot of lawmen, as he did in City Of Bad Men (1953). And as is so common with character actors in this period, he often went without credit. On TV, you’ll see him in Western shows like The Lone Ranger, Rawhide, Tales Of Wells Fargo and Maverick, along with Perry Mason, The Twilight Zone and The Lucy-Desi Comedy Hour. And that’s just scratching the surface. That’s a face I recognise but not the name. Nice still from Warlock. Sanders only did one Rifleman, “The Blowout.” Good one. Yeah, that’s the one. Great episode! Great series! He was my Uncle Hugh. I just turned on the television, and there he was in an old Western movie. I wondered if anyone still remembered him, so I looked him up on the Internet. It is nice to know that he isn’t forgotten. Nothing would make him happier. Thanks for stopping by. Your uncle’s in some terrific stuff — and he’s terrific in it. Just saw him in an episode of “Highway Patrol.” Excellent actor indeed! I’m writing up his MAVERICK episode right now; he was terrific as the prosecutor in “Rope of Cards”.